Colin Carruthers was born in Antrim Town in Northern Ireland where he spent his early childhood. He lived in Germany for a time and at various locations in the U.K., before moving to Birmingham in 1985. Having studied Fine Art at Margaret Street in 1994, he was drawn towards painting and completed a B.A. Honours degree in 1997. Colin is an intuitive painter sometimes working from sketches or photographs as a starting point. When Colin is not painting in his studio, he likes to draw inspiration from trips to the countryside and coast. He enjoys the experience of being outdoors and emotionally connecting with the landscape and its surroundings. 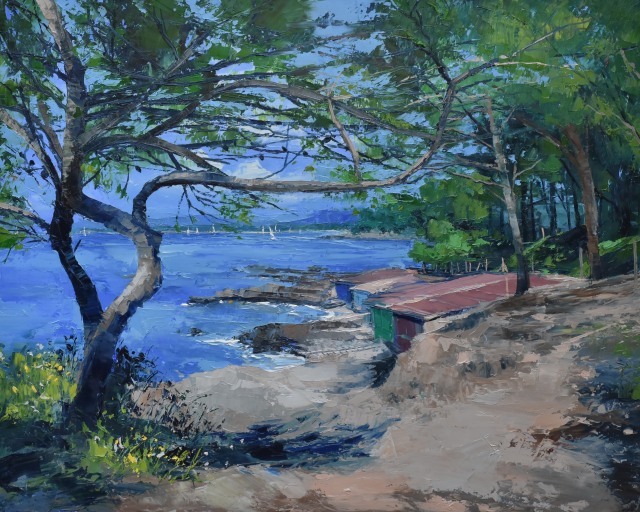 The light, weather and flora greatly inspire his practice as a painter and his paintings are a desire to capture something about the essence of being in any given location. Colin works with oils, acrylics and watercolour and his paintings are to be found in collections around the world.